One of the most scenic and lively towns in all of San Diego is Pacific Beach, referred to as P.B. by the locals. The small beach community is just north of Mission Bay, south of La Jolla, West of Interstate 5, and East of the great Pacific Ocean. The beautiful city has a very young and exciting feel to it but also a romantic coastline and several family friendly neighborhoods. On any given day you can find the rich and famous mingling with the college kids scene right on the boardwalk. Grand and Garnet Avenue are the main streets with plenty of nightlife, restaurants, cafes, and shopping. The city is surrounded with water sports, biking/walking paths, and beautiful scenery. You can go for a jog in the morning, surf for lunch, and be sailing in the afternoon. There is never a shortage of fun activities in P.B. Whether surfing is your thing or you just enjoy the ocean breeze, Pacific Beach has something for everyone and is the center of San Diego’s youthful lifestyle. Pacific Beach is an above average city in almost every statistic. The town has an estimated population of 45,000, median age of 31, and over 64% of its inhabitants have an education level of bachelor’s degree or higher. There are a total of 22,747 households and of those, 7,000 are family households. The per capita income of $31,117 is much higher than the national average of $21,587, most likely due to the higher cost of living in San Diego’s coastal region. The average household net worth is $450,349 and median home sale price is $630,000. The weather is beautiful year around with January’s average high at 65 degrees and low at 49 degrees, as well as July’s average high of 75 degrees and low of 65 degrees in July. During the hot months, you get a cool ocean breeze to keep you and your home from overheating. P.B. is located only seven miles from the San Diego International airport and three miles from University of San Diego. Most residences in Pacific Beach were built between the years of 1950 through 1989. Any home in the area is most likely at least 22 years old and probably much older, leaving a lot of uncertainty to the stability and quality of its infrastructure. Each year, repairs must be made to balance the extreme amount of erosion from the salty air. Most people are surprised by how strong the sea breeze is and how much damage it can cause to a home even a couple miles inland. Landlords must charge higher rents to pay for the repairs and renovations and home owners living in their home need to keep an eye out for structural damage, especially to the exterior of the building. The weather may seem perfect all year around, but there is more household erosion in Pacific Beach than most cities in the U.S. will every experience. Common Pacific Beach renovations are room additions, second stories, kitchen remodeling, outdoor spaces and even complete tear downs/rebuilding. Since Pacific Beach is a damp climate and ocean air can cause corrosion, clad aluminum or vinyl windows are a wise choice. Other construction enhancements to protect Pacific Beach homes from the weather are Tyvak house wrap for a tight building envelope, extended overhangs over west face walls to prevent leaks from a driving rain and positive drainage away from all foundations. As a densely populated beach town, the architectural designs of Pacific Beach vary from tightly-packed 30s-style beachfront cottages to large, pricey hotels and condos built with natural, earthy materials. Aside from the quaint residential areas that run adjacent to popular businesses and busy streets, Pacific Beach holds an architectural report card that runs from San Diego’s budding first moments to today’s most modern fancies. Primarily consisting of small studio apartments to four bedroom homes, the Pacific Beach residential neighborhoods offer older, well-established architecture that was built between 1940 and 1969. The newer, trendier architecture often found closer to the shore can be attributed to the 1970 through 1994 date range. Standing at 1111 Pacific Beach Drive, one of the most distinguishing architectural structures erected in Pacific Beach owes its existence to America’s oldest women’s rowing club. The Zlac Rowing Clubhouse was originally designed by architect Lilian J. Rice, one of the first women to earn a degree in architecture from the University of California Berkeley in 1910. The work of architect John Mock is visible throughout Pacific Beach in the many apartment complexes built during his time. Mock is responsible for architectural apartment outcroppings, and was recognized during his time for his omni-directional architecture that incorporated form, function and economy. Tower 23 is another shining star of Pacific Beach Architecture. This hotel is a stylish, contemporary, and luxurious urban building that brings in the natural elements around it with glass-boxed architecture. Designer and architect Graham Downes built this hotel and restaurant to bring in the tropical surroundings and play up the beauty of the natural atmosphere. Another tropical architectural gem is The Catamaran Hotel, which incorporates strong colonial Hawaiian architecture and tropical design that is carried throughout the hotel. Pacific Beach is also home to new styles of architecture. Many of the most recently built residences are multi-million dollar houses with spiral staircases, infinity pools, and theater rooms that show off the latest in ultramodern styles. From practical apartment complexes to luxurious hotels with tropical themes, Pacific Beach architecture and home design provides an interesting reflection on the area’s history and growth. Since 1975, Murray Lampert has provided Pacific Beach homeowners with professional design, construction, and home remodeling services. How can we help you with your next expansion or remodel? Read on to find out. Murray Lampert has contributed its services to the city of Pacific Beach for over four generations, during which time we have developed close relationships with some of the best inspectors, distributors, and trade partners in the area. These longstanding relationships with business experts allow us to deliver an innovative product with unmatched craftsmanship and superior customer satisfaction. We maintain an A+ with the Better Business Bureau and received the BBB Torch Award for Marketplace Ethics in 2007, 2008, 2010 and 2014. Whether you’re looking for home remodeling services in Pacific Beach or just want to weigh your options for expansion, we have you covered with a wide range of services. Kitchen Remodels - A professionally-designed kitchen remodel in Pacific Beach can add style, function, and value to an outdated kitchen. Second Story Additions - When lot sizes are limted, second story additions provide a great option to increase square footage by building vertically. Outdoor Living Spaces – The weather is Pacific Beach is pleasant year-round, and what better way to enjoy it than with a custom outdoor living space to fit your lifestyle. Green Home Building – Our team is committed to following best practices when it comes to energy efficiency and green home construction techniques that help preserve the plant, as well as your budget. Room Additions - Whether you need a new home office, expanded living room, or garage conversion, we specialize in Pacific Beach room additions. 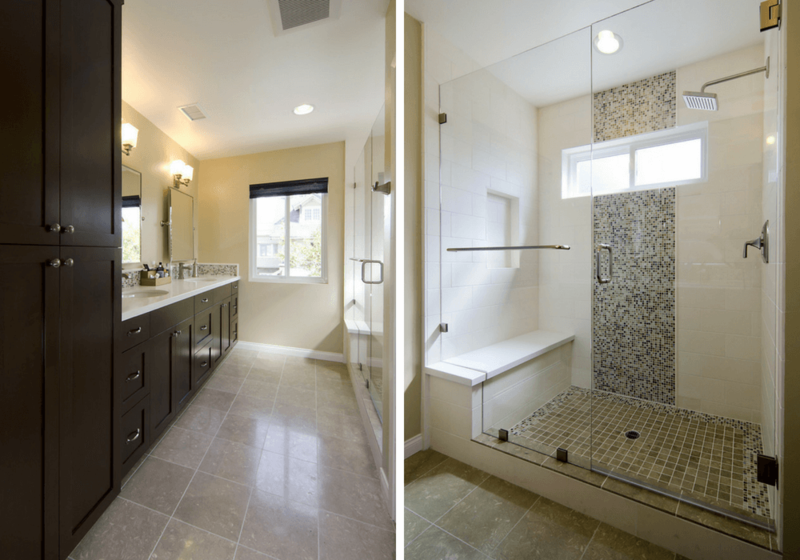 Bathroom Remodels – Upgrade an outdated bathroom with stylish fixtures, new flooring, efficient plumbing, and more with a bathroom remodel in San Diego. 3D Project Modeling - Using the latest 3D modeling technology, we’ll give you a preview of what your remodel will look like when it’s all finished. Custom Cabinets – We offer our clients the option of custom cabinets, which provide storage and style to any remodeling project. Architectural Design - You’ll work directly with our staff to create a architectural design that is customized to suit your needs - and your budget. Each home remodeling project we take on in Pacific Beach begins with a free in-home consultation. During that consultation, you’ll collaborate with our in-house architect to identify exactly what you need in order for our team to deliver a finished product that stays within your budget and timeline. Before we break ground, we can give you a virtual walkthrough of what the remodeled space will look like using 3D rendering technology. Since 1975, Murray Lampert has built a rock-solid reputation by making transparency, communication, and integrity the foundation of our business. We’re proud to say that approach has been effective, and is reflected in our client testimonials and positive reviews. If you have questions about our home remodeling services in Pacific Beach, or if you’d like to schedule your in-home consultation, please don’t hesitate to reach out to our team today!